There are many groups out there that are doing great advocacy work on behalf of peer support and those that provide peer support. Our advocacy at Peers for Progress focuses on educating decision-makers to achieve organizational and systems level changes. Our objective is to encourage the adoption of peer support programs, to establish sustainable funding for peer support programs, and to strengthen the peer workforce. To achieve these changes, we have produced several resources that make a strong case for peer support, as well as guidance on conducting advocacy activities. This article looks at priorities in scaling up peer support in the Department of Veterans Affairs. From our experience promoting the adoption of peer support programs in the Greater China region, we generated this brief on our overseas advocacy. 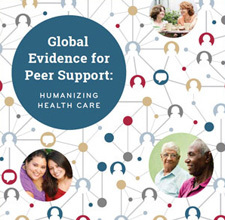 In 2013, several work groups of the National Peer Support Collaborative Learning Network produced advocacy resources for peer support.